"A stunning subject is spread out facing east, the Mont Sainte-Victoire." In such terms Cezanne, then thirty-nine, pointed out to Zola the landscape which was to preoccupy him until his death. He painted the mountain sixty times and in his final versions dating from the years 1904-6 he achieved a radiating and vibrant conception; each plane seems to float in open space in a luminous reflection. Space is no longer something set but free. The brushstroke no longer represents this or that object but several depths at the same time. Taken in a cosmic mixture, each brushstroke is both earth and sky, reflection and matter, the ephemeral and the immemorial. 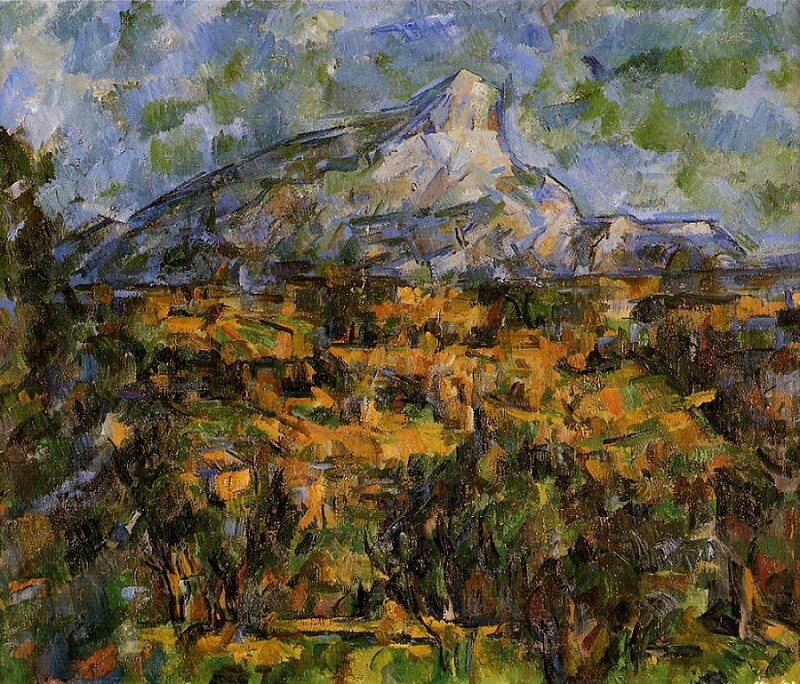 "I remained for a long time without being able to paint, and without knowing how to paint, Mont Sainte-Victoire," explained Cezanne to Gasquet, "because I imagined the concave shadow as the others who fail to look, but look, it is convex, it vanishes from its center. Instead of heaping up, it evaporates, becomes fluid. It takes part, all bluish as it is, in the ambiant breathing of the air. . . .Look, what elan, what urgent thirst for sunshine and what melancholy in the evening when all this weight falls. . . . These blocks were fire. There is still fire in them. Shadow, light, seem to withdraw trembling, in fear of them." Details reveals Cezanne's unbelievable freedom in the treatment of the surfaces. Not only does he seem to paint disorderly dark spots but also he leaves small areas of the canvas untouched as though to make the pigmentary material "breathe." Here again we are asked to "read" and to place these white, untouched spaces in the third dimension.